Every photo has a story. So why not share it out in the open! There’s a reason why you pull out the camera to capture a moment. We’ve come to the digital age where it’s so easy to snap endless pictures. But, the shots get buried in a device and sometimes forgotten. For as long as I’ve been a mom, (almost 23 years!) I’ve always had a camera with me to capture those sweet moments. Back then, it was savoring that perfect moment with every single shot. Which usually meant only breaking out the camera on Christmas and birthdays– or on really special moments. Because if you clicked (yes, that was the term used then) a photo of someone, you’d better make sure they didn’t blink! You only had up to 24 chances before the film cartridge was full. You couldn’t review the image or delete it. You’d usually have to deal with paying for the bad ones to get developed. I do have to say, my youngest has thousands images, more than my other sons. Not because he’s the youngest or favored more than the other boys. (As my older boys tend to think.) But the reason being, technology has obviously changed through the mommy-taking-pictures years. Take some candid moments of your loved ones… and develop the images! Isn’t it fun having a displayed photo where you can always see it? Yeah, it’s nice to pop open the phone and show someone an image. That is, after you scroll and scroll for a minute. But, why not make something special for someone you love? 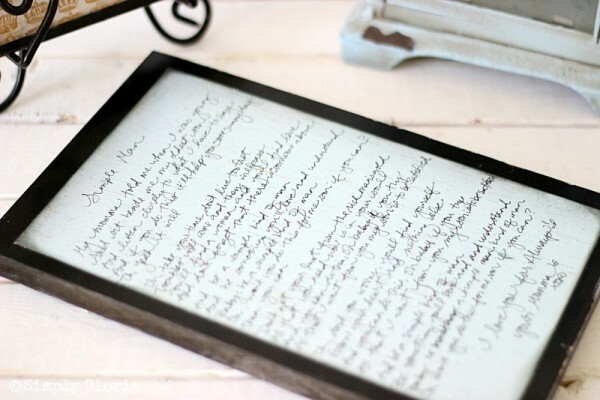 Having a handwritten message or words of a song on the back is a reminder how much you love them. Using your own hand writing is and will forever be precious. It definitely does not have to be perfect! I picked the song Simple Man lyrics for the back of each one. My older boys jam this song on their guitars all the time. This version is played A LOT at my house! 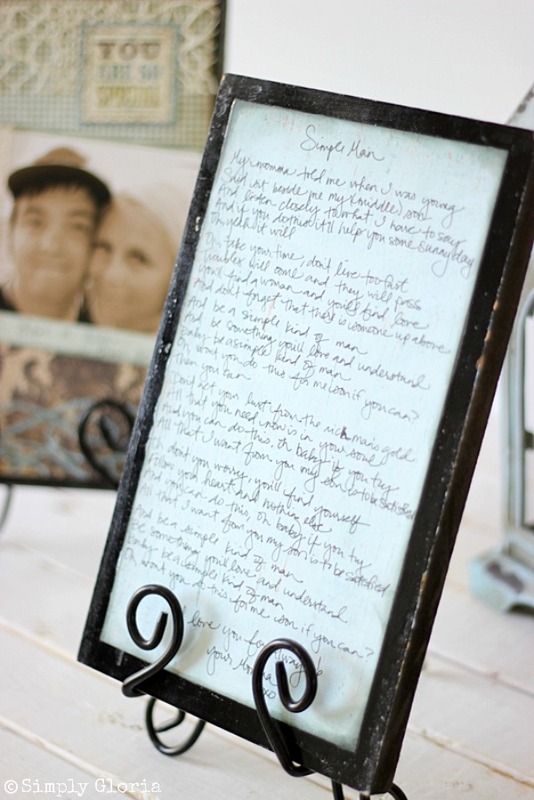 So, it fits right to place the lyrics on the back of each of their frames. As I think of nothing else but about my boys, when I hear this song. MDF raw wood, 7 inches by 11 inches. 4 inch by 6 inch candid photo, pick one that can be trimmed. 2 different colors and shades of 6 inch by 6 inch cardstock paper, for front. 1, 6 inch by 10 inch long cardstock paper, for back of wood with written message, optional. decoupage glue and sealer, I use this one. labels and embellishments, optional. The scrapbook paper manufacturer usually have coordinating labels and embellishments to match the paper. Directions: Spray paint all sides of the wood. When dry, scuff the sides and edges. Cut the two pieces of paper for the front. Over lap one paper onto the other. (I tore the overlapped edge, instead of straight cutting it.) Use the ink pad and dab along the edges. Glue and fold the edges of the ribbon under the paper. Same with the ribbon near the picture. Have everything in place before gluing and sealing onto the wood. (I sealed right over the picture. The sealer protects the picture.) Brush the painted wood with the glue/sealer. Place the papers onto the surface. Allow the paper to dry to the surface before gluing/sealing the top of paper and picture. Do not put sealer on the ribbons. Repeat with the paper message for the back of the sign. This is for a 7 inches by 11 inches picture frame sign. You may cut it to any size you’d like. You will be able to find all of these materials in the scrapbook section at the craft store. The wood, at a home improvement store. Different colors, shades, layers, and textures are so fun to put with your image! Have fun with it and bring out your creativeness! What do you like to do with your favorite images you capture? That is one of my favorite songs and Shinedown’s version is so good! Love that it is so personalized and something they can carry with them through every point in their lives. Gloria, I just think this is the cutest, cutest project. I pinned it earlier….Have a great night! I love this Gloria. I totally agree, digital is nice but too many photos never get printed. I have tons of actual photos of my son and very few of my daughter. I always feel a little bad, but that was when everything was changing from film to digital. I’m gonna do this too 😀 Thanks!! Gloria, these are just amazing. 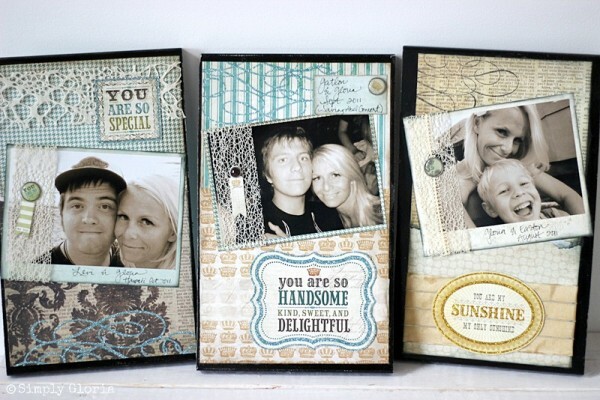 You have a real knack for colors and scrapbooking! And, can I have your handwriting?? I agree, its so easy to capture moments with todays technology, but because of that, so much of it never gets a second glance (vs when you actually had to be choosy about what you snapped! 🙂 ) I bet your boys loved these, and even if they didn’t now, I know they will in the future. These kind of things mean so much! LOVE Shinedown, Gloria! And Simple Man is one of my favorite songs by them. I saw them in concert back in 2006, I believe, and they performed that song! What a sweet idea. I take TONS of pictures and love scrapbooking, but I haven’t done anything with my scrapbooks for 9 months! 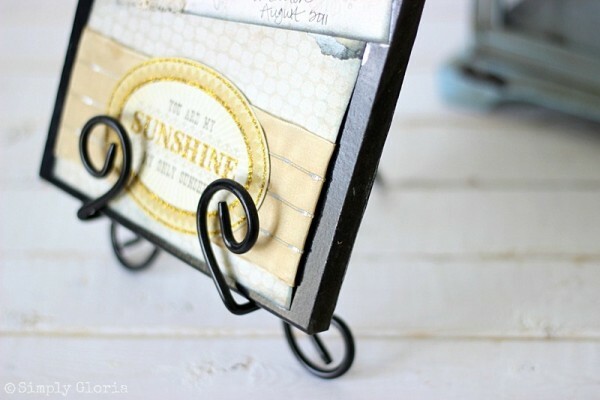 This would be such a neat way to use up some of my scrapbooking supplies and get those pictures out of my phone and onto a shelf. Thanks for linking up again to Thursday S.T.Y.L.E. These are delightful! 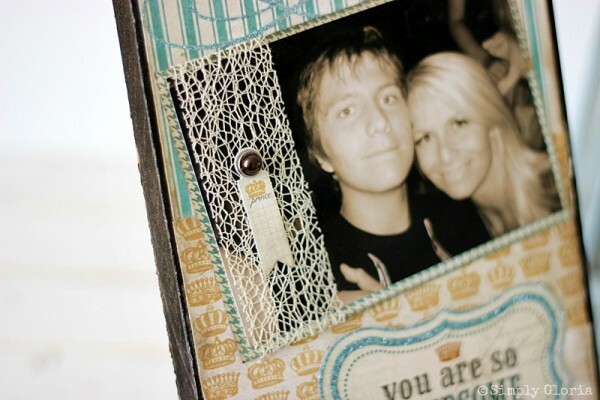 I love the polaroid look of the pictures, and they are so personalized! I must do this! Thanks for posting. 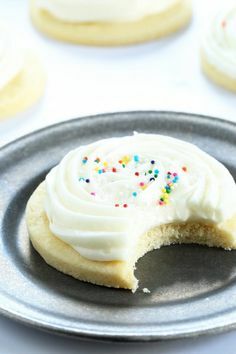 Pinning. Elizabeth recently posted…Learning to Say NO, Nah, Uh-uh, Nope! I love this! 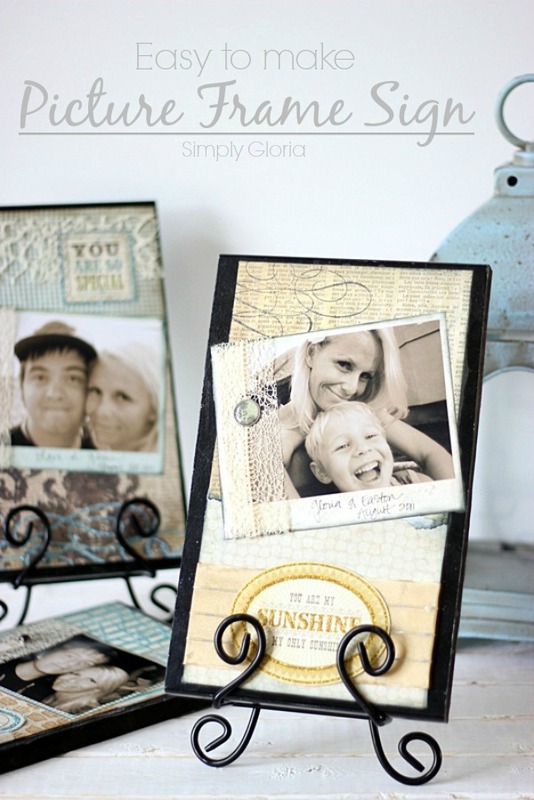 I’m featuring you at my Tips and Tricks Linky Party tonight. Thanks for linking up!